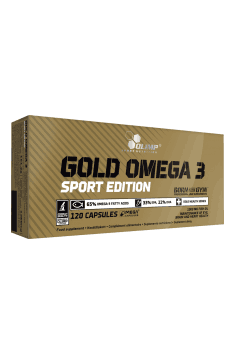 Olimp Gold Omega-3 Sport Edition is a high-quality supplement providing unsaturated fatty acids DHA and EPA. The composition of the product has been enriched in vitamin E, which support the effectiveness of omega-3 fatty acids in the organism. Docosahexaenoic acid demonstrates especially vital role in the work of the nervous system. Up to 60% of the structural composition of cerebral cortex is composed of DHA. As the component of lipid membranes of cells creating brain, it conditions proper conduction responsible for processing stimuli, coordination and regulation of the work of the whole body. Moreover, DHA constitutes a precursor, essential for the synthesis of two incredibly essential neurotransmitters – serotonin and dopamine. The first one is responsible for regulating basic needs of the organism, such as sleep, appetite or sexual behaviors. It is also responsible for regulating body temperature and disorders in the synthesis of serotonin are the cause of mental disorders, especially depression. Dopamine, in turn, is mainly responsible for coordinating human musculoskeletal system (its deficit is the main pathogenesis factor of Parkinson’s disease). It also regulates emotional behaviors and influences the synthesis of other hormones. It is commonly called a “pleasure transmitter” and its synthesis is stimulated, among others, by cocaine. Eicosapentaenoic acid in the human organism is mainly responsible for the synthesis of eicosanoids. These are tissue hormones, regulating organism’s homeostasis. The most important eicosanoids conditioning the presence of EPA are prostaglandins. Their main function is regulation of the activity independent of the will of smooth muscles, therefore they influence the work of the respiratory, digestive and circulatory systems, ensuring proper adjustment of organs to currently prevailing environmental conditions. They also belong to mediators of inflammation, having inhibiting influence on its development. In regulating inflammations they also play the role as leukocyte chemotaxis. The correlation between DHA deficiency and emotional development in children is highlighted more and more often. The deficit of docosahexaenoic acid is considered to be one of the main causes of ADHD. Moreover, children, whose diet from the first days of life (by the presence in mother’s milk) is rich in the supply of DHA exhibit higher level of intellectual development in comparison to their peers. In adults, DHA is used in the therapy of bipolar disorders and schizophrenia. Eicosapentaenoic acid has the influence on the functioning of the cardiovascular system by means of prostacyclins, of which it is a precursor. They ensure homeostasis (maintaining blood fluidity in vascular bed) in standard conditions by preventing thrombocytes aggregation. They also have diastolic effect on blood vessels and lower blood pressure. In pathological conditions, another group of EPA derivatives, thrombaxanes, is responsible for regulating blood coagulation. Other important eicosanoids derived from eicosapentaenoic acid are leukotrienes. They are responsible for regulating the functions of the immune system. The disorders of their synthesis are one of the main causes of asthma and various allergies. Intermediation generated by leukotrienes is equally essential to maintain proper response from the immune system and the ability to effectively defend from pathogens. Olimp Gold Omega-3 Sport Edition is a supplement which constitutes a complex solution to omega-3 acids deficiency in a diet. Each capsule contains the highest quality fish oil characterized with high concentration of EPA and DHA acids with the simultaneous purity from all toxins present in saltwater fish. The additive of vitamin E constitutes an additional discriminant of the supplement, guaranteeing maximal effectiveness. 1-2 capsules a day, during a meal. It is recommended to use the preparation during a meal which is a source of fats, thanks to which it may be better absorber and moreover, thanks to this we may avoid the feeling of discomfort in the digestive tract. Capsule components: gelatin, water, glycerol.